Black Knight Bison Bar appears to be a brand of Black Knight Bison Ranch, Inc. based in Norfolk, NY, and seems to have launched this year. I tried to call the company for additional information, but I got a recording for "Paradico Farms and Resort", and told me I needed to leave a message. But it seems the company is aggressively trying to market their new Bison Bars, which are actually a blend of bison and beef, though I couldn't find the exact ratio between the two. The company's website says they are mailing out a free Bison Bar to anyone who wants one. Black Knight Bison Ranch is using the soft and moist chewing of these bars as its primary selling point, noting that other brands of jerky are "hard leather like pieces". Their blog goes on to say their bars tease your taste buds with "an explosive hickory flavor." Buffalo, beef, soy sauce, salt, sugar, sodium acid pyrophosphate, spices, brown sugar, garlic powder, spice extractives, maple sugar, sodium nitrite. The first thing I taste from the surface of these pieces is a black pepper flavor. A faint smokiness noticed soon after, while a saltiness comes in later. The chewing flavor starts with an increased smokiness and saltiness. A light amount of natural meat flavors is noticeable, along with a bit of garlic. I'd say the flavor that dominates this jerky more than any other is a combination of saltiness and the hickory smoke flavor. The saltiness is perhaps the stronger of the two, and what I would consider as being "high". I don't have the nutrition facts for these Bison Bars, but it wouldn't surprise me if it listed a high sodium content. What the company described on its blog as having an explosive hickory flavor seems to hold true. It has that same salted hickory smoke flavor that you find in much of those chopped & formed bargain brands, like Smokecraft or Lowrey's Big Beef, and even reminds me of the jerky my mom used to buy in the 1970s. The black pepper plays a significant role in the flavor. There's a good deal of "bite" in the taste, and these bars even have a strong black pepper aroma. The natural meat flavors account for a smaller, but still noticeable part of this jerky's flavor. As for this being made from a blend of bison and beef, it still tastes like regular chopped & formed beef jerky to me. The garlic seasoning rounds out the other noticeable flavor. Despite sugar, brown sugar, and maple sugar listed in the ingredients, this doesn't have much of a sweet flavor. There is perhaps a touch of sweet in this, but it doesn't really strike me as a noticeable flavor. Overall, what you're going to notice in this is primarily well-salted hickory smoke flavor, with a good deal of black pepper seasoning. There's some noticeable natural meat flavors, but you won't find anything that makes this bison meat taste different from beef. And finally, a noticeable garlic flavor. 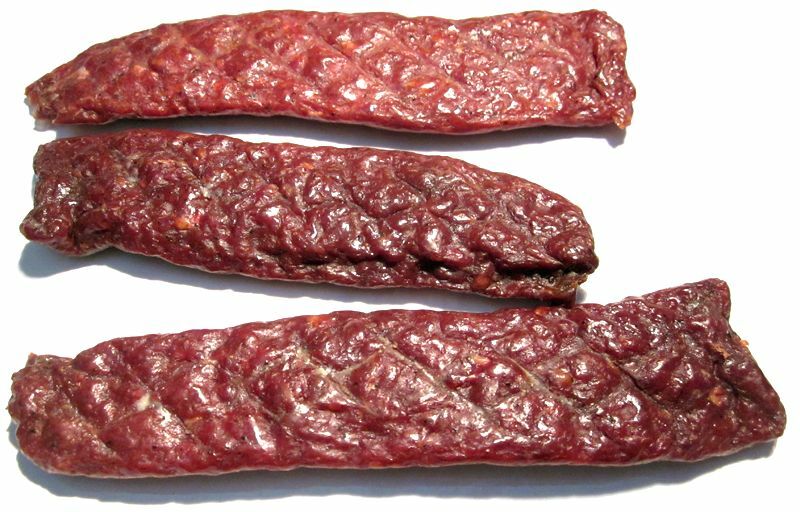 This is a chopped & formed jerky, pressed into thick strips measuring about 5 to 6 inches in length, and about 3/4 to an inch wide. These are semi-moist strips with a moderately oily surface feel. The strips are quite flexible, despite how thick they are I can bend them completely back on themselves without any cracking. Biting off chunks seems easy to do, while chewing also seems easy. The chewing texture starts out feeling soft, and presents almost no chewing resistance. In the chewing, they break down into little bits quite easily, and renders into a soft mass with little effort. At that point, they don't really feel like chewing real meat, it's quite crumbly, like an over-cooked meat loaf. For being a chopped & formed product, I didn't feel any hard or crunchy bits of material, but in looking at this stuff I do see some white bits and yellow bits and translucent bits of tissue, suggesting that's there more in here than just meat. As for clean eating, each handling leaves a light film of oil on my fingers, just enough that I have to wipe them on my jeans before touching my keyboard. 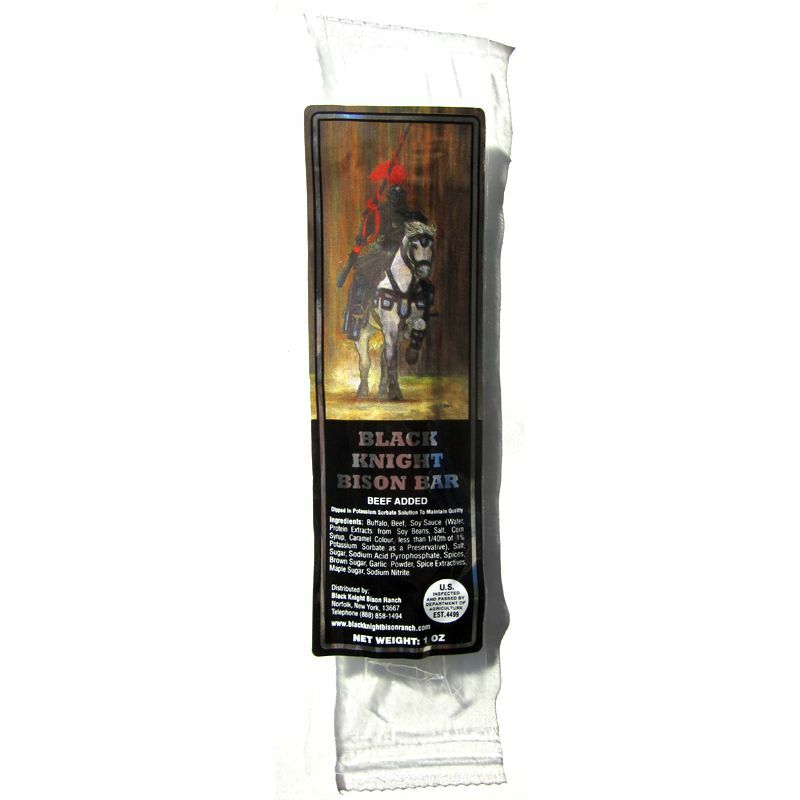 Black Knight Bison Ranch sells these bars at a price of $35.40 for a box of 12 1oz bars. The more boxes you buy, the lower the overall cost. If you bought two boxes, the price is $64.80. They'll tack on shipping of $10.28 if shipped to my residence in California. That's a total of $75.08 for 24 bars, or a price of $3.12 per ounce. 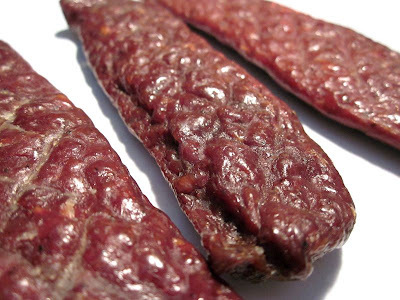 For general jerky snacking purposes, at the $3.12 per ounce price, it's a poor value. I'm getting only an average amount of snackability due to an average flavor, a crumbly chewing texture, though it's soft and easy to eat. By comparison, you can get Jack Link's Beef Steaks, which are chunked & formed bars in 1oz packages in a box of 24, for $25 to $30 on Amazon.com ($1.00 to $1.25 per ounce), along with free shipping, and get comparable or better snackability. These Bison Bars from Black Knight Bison Ranch provide mostly a well-salted, hickory flavor coupled with some black pepper that takes me back to the old chopped & formed jerky brands of my youth. There's a light natural meat flavor in these strips and some garlic to round the flavor, all put together in a semi-moist, easy to eat, chopped & formed jerky. Compared to other chopped & formed jerky brands I've evaluated, I didn't find anything in this unique or out of the ordinary. The overall flavor seems unremarkable. It seems to generate a fair amount of snackability due to it having a lot of flavor and being soft and easy to chew. But that's really all there is. And for these being made of bison, you're only getting a light natural meat flavor, and then these bars are actually a mixture of bison and beef. I didn't taste anything that differentiates this from pure beef, so I don't feel as if there's any value in this being made with bison. The price of these Bison Bars is quite high, and yet didn't give me any reason why I should spend that much money, unless I really have to have that old fashioned jerky flavor. The Jack Link's Beef Steaks seems comparable to these Bison Bars in terms of their size and form factor, but cost far less, and still offers a comparable snackability. I think a good beer pairing for this a brown ale. Try the Newcastle Brown Ale or the Moose Drool Brown Ale.